This bug report was converted into a question: question #166003: Residual Amount Show Double Amount of Invoice Amount. 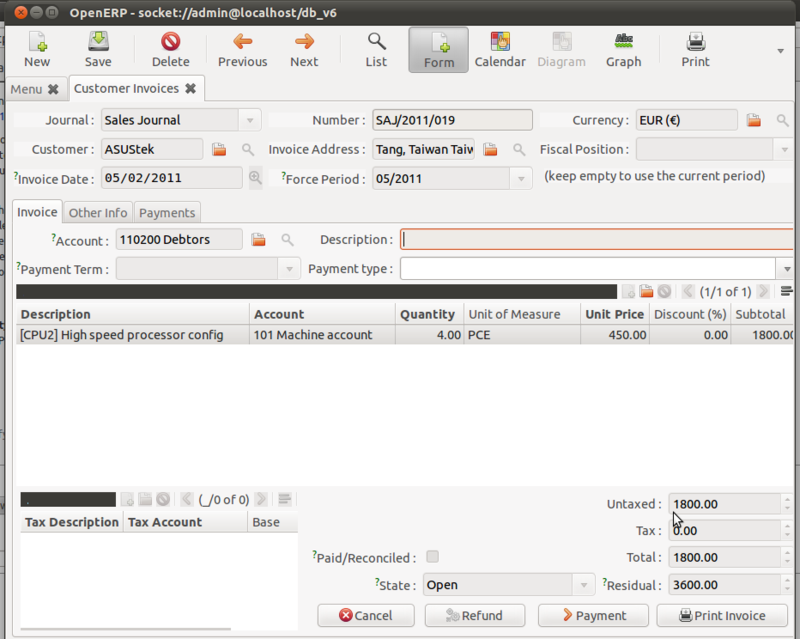 I have purchase one machine and want to create invoice in openerp_6, but when i create invoice line with account of Fixed Assets with internal type (except regular) and than i go for valid invoice that time system give me Double amount of Invoice in Residual. I think this problem may arise with fixed coding on internal type, due to double amount in residual all accounting entries are going to wrong. so your support make openerp strong and flexible . We can use move_line_id_payment_gets method on Account invoice to filter move lines. So if we call above method it just returns move lines which we have to pay (i mean only receivable/payable) from amount_residual. The method should overlook "Tax Payable" as that is already in the total. The problem is that it is adding the tax again. Therefore the method is now overlooking the Tax. This however may not work for some charts of accounts. Can someone suggest a better fix. Maybe if we had a separate move_line.account_id.type such as tax_payable. do this :- select different account whose internal type except regular type, than you find that residual amount calculated = 2 * invoice amount. so how you manage your account and how you handle your payment respect of that invoice. i think this create very big problem if not to be fix. We have the same issue when we validate an invoice : residual amount = Net price + tax +tax again. Instead of modifying the code, I checked our VAT accounts which were of type 'payable'. I change it to 'normal', like in the swiss localization we use and the problem was gone. I can create create correct invoices now. I hope it is correct and it will help. With the reference to #8, i checked all the possibilities and found that it's happen due to wrong account configuration. Only partner has receivable and payable accounts. As you can see comment #8, they have solved the problem like this only. @SJA Did you check if tax account type is not payable or receivable ? I think you are on wrong track, i am not talking about partner receivable and payable account i am talking about selection of account in order line, for your kind information we are not making invoice for sale and purchase of goods only, we can received invoice in respect of purchase of Building and other assets, so how you handle these type of situation. In case if you select income account and expenses account that is wrong for you account (that is weakness of account). and system never fixed for some particular prefix account, that must be flexible at all time. Before changing the status invalid please make habit to check all the criteria. I am using OpenERP 7 with Colombian localization packag and the issue still affect us. If the proper setting of internal account type for VAT account is payable or receivable, in this momento it can not be done so the taxes will be applied twice. So we select internal account to regular, but we did not know the effects of doing that for example in the reports section,etc. InBrazil the same error occurs. How can I fix it?